Ingun Bjørnsgaard takes playful hold of Henrik Ibsen’s most renowned female character Nora (”A Dolls House”). One of Scandinavia’s foremost choreographers continues her deconstructive and liberating investigation on iconic dramatic works. Piano Concerto No. 2 in B flat, Op. 83. Quartet, Op. 115: Ii Adagio. January 16, Ice Storm 2016, Gerald W. Lynch Theater, New York City, U.S.(excerpt). The most profound impression is the display of the fast transition from great power to complete powerlessness. Ibsen let Nora leave her husband and her children. But how far has she actually come in 135 years? Ingun Bjørnsgaard’s dance performance Rotating Nora shows us that this is still debatable. What exactly is feminine? Quite a lot has befallen the female role in our part of the world after Nora left Helmer and the children. But where are we today? And what has happened with masculinity during this period of squeezing and discarding of old gender roles? Now a male dancer enters the stage. He makes different large movements, but after a short while he lays there in a twisted position. Monotonous tones and lingering music envelope the stage. Conflicts. This is the prelude. After a while four more dancers arrive. The three women and the four men unfold in an hour long performance that, with only the most required references to Henrik Ibsen’s play, portrays the challenges we face when we want to be individuals, and to belong. How our expectations often create conflicts, not companionship. Bjørnsgaard doesn’t claim this is easy. We still haven’t solved the puzzle. On the contrary: Did we not see something resembling a «cup cakey» pose in one of the segments? This is one example of the elegant humour that characterizes the play, serious though it is. Towards the climax of the play we also witness Ingun Bjørnsgaard’s ability to create impressive movements with clean lines. And the dancers perform with the utmost authority. The most profound impression is the display of the fast transition from great power to complete powerlessness. There is a humility here that could be useful to recall when we stumble in the steps of Nora and Helmer. Leap. You may wonder if people who build their works upon references to the great classics, do this as an easy way to gain attention. This suspicion does not affect Rotating Nora. When someone has created a piece that has become a reference to the degree that Ibsen did, it’s natural that others want to leap from that material, and develop something of their own. This is what I’ve learnt after twenty years of dance lessons. «Extraordinarily redeemed and mature – while at the same time fresh as dew.» Chris Erichsen writes about Ingun Bjørnsgaard’s Rotating Nora. 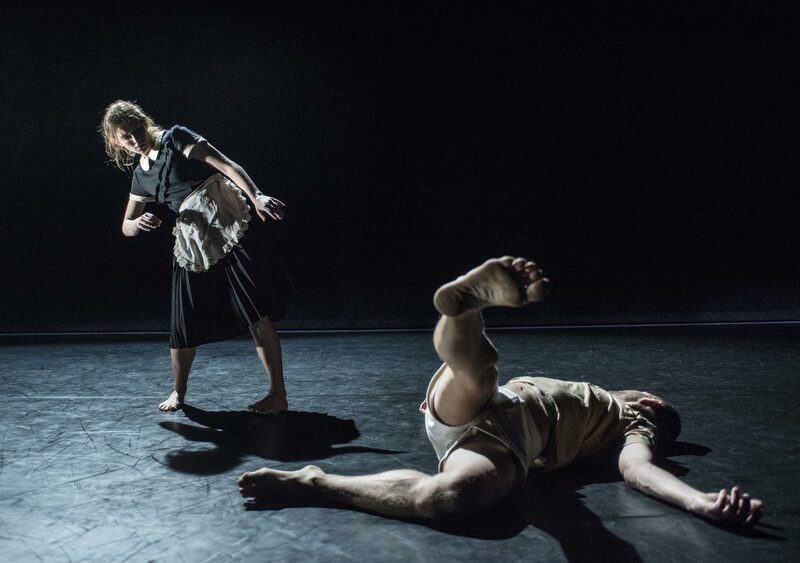 Dansens Hus also participates in The International Ibsen Festival 2014 . What is left when the words are gone, I asked in a previous review. An obvious answer is: Dance. But when competent people tell me that I should review dance, I automatically start to look for ways out. I might mumble something about humility and tiptoe down to Black Box Teater where one is not so concerned with what to call things. 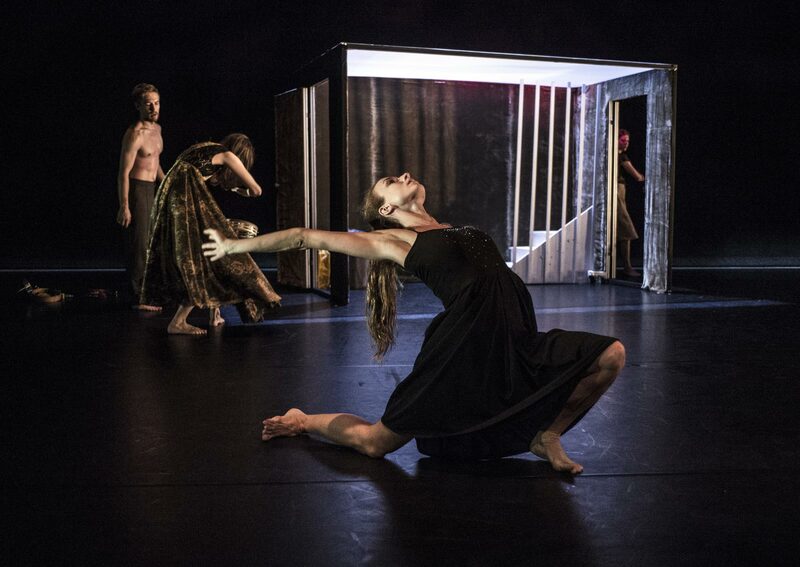 So, when Ingun Bjørnsgaard Prosjekt, in connection with Ibsenfestivalen, presents what is called a «refurbishing» of A Doll’s House, with the dedicated Kai Johnsen as the playwright, the road to that scary place Dansens Hus suddenly doesn’t feel all that long. And then the Matrix-like universe that greets me, with a row of flames shooting up from behind the long bar, and the Lara Croft-like women dressed in black swirling around in the lobby with their earbuds, wireless microphones and flashing gadgets in their belts, feels like an including and integrating arena. The first thing that happens, and this is also the first time I have ever seen this, is a pas de deux between a dancer and a robot vacuum cleaner. With this Bjørnsgaard sets the tone for a conglomerate of expressions, a mixture of humour and seriousness, helpless clumsiness and supreme elegance, beauty and brutality, all permeated by an ubiquitous sensitivity. The floor is taken by three women and three men. Who plays/dances who is unclear, and not really that important. Here the play’s characters, stage directions and approaches are used to independently create something new. The tarantella is here the artistic fulcrum. 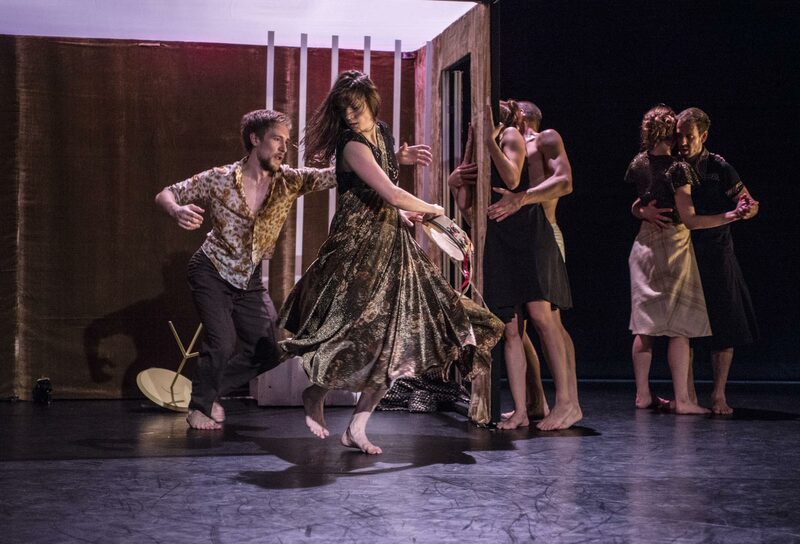 This wild folk dance, originating from Italy, that Nora flings herself into, in an erotically charged attempt to flee from all the disasters building up in her life – immortalised by Lise Fjeldstad in television’s 1973 version of A Doll’s House. But here we move on, so to speak, from 1879 via 1973 and into the present. New constellations between and within genders are tested by an enormously physical repertoire. 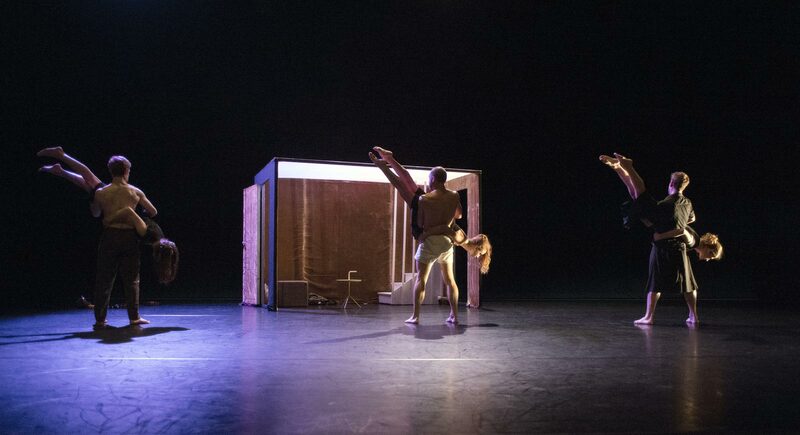 Synchronised and unsynchronised, movements that propagate from body to body, parallel lives that are lived in several places on the stage simultaneously. Here are spectacularly comical falls à la Jackass, slow and poetic rotations, sculptural and static tableaus. All this is supported and contrasted by a piece of sound and music spanning from a skewed and restless electronic Kontentum, to powerful, liquid excerpts of Brahms, composed by Eivind Buene. Suddenly «Nora» jumps in with the tambourine. Her awkwardness reminds me of that of David Byrne, the frontman of Talking Heads, and his hilarious demonstration of «this is what I’ve learnt after twenty years of dance lessons». And suddenly pure, unadulterated beauty takes over. Then a combination of insecure, staccato movements accompanied by fluent, beautiful music. And vice versa. Set designer Thomas Björk has created a sparse, yet at the same time incredibly dynamic, scene image where a small interior, a hallway, abruptly appears in the middle of the black stage room. 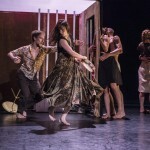 This becomes the arena of a moving intermezzo where gender play takes on a more classical and traditional shape, and where the men look longingly towards the locked door where the women are. There comes a point where I sense my already sparse professional filter is ruthlessly disintegrating. I don’t have a vocabulary to hide behind and simply have to surrender. There is something extraordinarily redeemed and mature here – while at the same time fresh as dew. The dancers do the strangest things with the greatest confidence, and the most beautiful things with a relaxed basic attitude that simultaneously is full of passion and dedication. This is how something might look and sound when the words are gone.